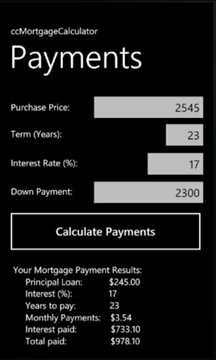 A simple mortgage calculator. Enter your Purchase Price, amortization period, interest rate, and downpayment, click a button and find out what your monthly mortgage payments will be, along with how much your total interest costs will be if the entire term is kept at that rate. More to come on this application, will be adding an Amortization Table, a property tax calculation element plus others in coming versions. This is your chance to get it now at a low, low price!